currency exchange rates as of December 31, 2018.
proclaim and live the Gospel. we strive to glorify God. development workers to affirm the Godgiven dignity of all people and offer them tools to escape poverty. isolation of life in poverty. men and women still live in extreme poverty. We serve because families in poverty have great potential. Over 1.7 billion people don’t have access to the financial tools needed to grow businesses, secure savings, and make other household improvements.2 We believe investing in men and women living in poverty unlocks their God-given talents and skills, equipping them to provide for their families. Almost 1 in every 4 people globally is unbanked. We serve because the Gospel is central to poverty alleviation. Only 6 percent of microfinance clients worldwide are served by a Christ-centered organization that cares for both their material and spiritual needs.³ We desire to see men and women around the world find their soul’s satisfaction in Christ and become dignified, hope-filled providers in their families and communities. Through regular interactions, staff members share the Gospel, facilitate Bible studies, and invite clients into a deeper relationship with Christ. LOANS With access to capital, clients can invest in their businesses by purchasing productive assets, buying supplies in bulk, or making other improvements. businesses, or pay for routine expenses like school fees. unity. Everyone was by themselves. HOPE INTERNATIONAL IS A collaborative network of both HOPEmanaged programs and missionally aligned field partners—all joining together to share the Gospel and empower families with tools to create a better future. over 3,500 Paraguayan men and women through partnership with Diaconía. In 2018, the HOPE network served nearly 925,000 men and women worldwide. for each otherâ&#x20AC;&#x2122;s needs. Where poverty has brought loneliness and isolation, savings groups foster Christ-centered fellowship and support. businesses to include taxis as well. bicycle drivers, the Abakundana (“The ones who love each other”) savings group began meeting informally in 2003, only starting to save together years later. more goods and increase their income. crops. Sometimes, it wasn’t enough. were nights where we had to go to the neighbor to ask for matches to make fire. two nephews to care for her chickens. her pastor, who shepherds seven churches. leave the city, moving to a rural area where they had built a house on Gonzo’s family’s land. PRAY FOR SUCCESS Pray for Success and the nearly 3,000 savings group members in Zimbabwe, where people are struggling to provide for their families in the face of economic uncertainty, inflation, and unrest. Pray that savings groups would be a source of encouragement and that members would have confidence in Jesus as their rock. will join savings groups in communities HOPE would otherwise be unable to reach. Our SG Multiply partners THROUGH SG MULTIPLY, WE’RE working alongside other Christ-centered organizations as together we join in God’s Kingdom work around the globe. HOPE & partner codesign ministry. HOPE trains partner to launch & support savings groups. Savings groups form, and HOPE provides ongoing support to partner. accounts to save for future goals. clients over the previous year. and increasing her financial security. couldn’t manage the business alone. She worried about not having enough to buy food for her seven daughters. A shared heart for the underserved THE NAME DIACONÍA COMES FROM the Greek word diákonos, meaning “servant” or “messenger.” Like the deacons in the Bible, the Diaconía team has a heart for serving and sharing the Good News. HOPE is excited to invest in Diaconía— our newest microfinance partner—as they are poised to reach more people. Currently serving over 3,500 clients, Diaconía will launch a second location in early 2019, with plans for a third office later in the year. Partnerships are mutual. As HOPE provides funding, strategic planning, and spiritual support, Diaconía in turn invests their local expertise, innovative history, and leadership back into the broader HOPE network. prayer at community bank meetings. tailoring. These Christ-centered courses build a culture of prayer and community. credit barriers stand in their way. vendors, architects, and interior designers. Anca opened Piata 9 in August 2018.
change those statistics. After spending 10 years working in upscale butcheries in Ireland, Daniel was discouraged with his company’s singular focus on profit, and the couple missed their church and community in Oradea, Romania. Their hearts set on a dream, they moved back home. I believe in Oradea and the people who live here.” Daniel Galea, ROMANIA Although bribery and other corrupt practices are commonplace for Romanian businesses, the Galeas have done everything by the book, and God has blessed their efforts. Daniel is thankful for the help of ROMCOM, which unlike other organizations, took an interest in him personally. “ROMCOM staff were very friendly and paid attention to our needs,” he shared. “They showed interest in my vision and plans.” Thanks to that vision, Daniel and Anca are sharing hope with many in Oradea. Members of a savings group in South Asia* enjoy fellowship together. than rely on outside charities or services. We empower parents to provide for their families and communities. consistently for their family’s basic needs. looking very bright for Keza. group inspired HOPE’s first children’s book, Keza Paints a Bright Future. will work together to meet one another’s needs. Community Finance, which serves both urban and rural communities, relies heavily on financial literacy and business training to equip and invest in their clients. To specifically meet the needs of lowliteracy clients, Turame piloted a new training tool in 2018: a flipbook. Adapted from curriculum developed by World Vision’s VisionFund, the flipbook (example on right) uses illustrations of a man and woman as they navigate decisions about borrowing wisely. Since launching in October 2018, 15 groups have completed the training pilot. 90 percent of the Burundian population lives off of the food they grow themselves. college, it took three years to find work. revenue to invest in those we serve. HOPE and partner staff worldwide. HOPE Board Vice Chair; Principal, Cereus Partners Inc.
financial services and the hope of the Gospel. to recycle repayments to invest in even more families. for HOPE to serve one client for one year. less than 1 percent of U.S. nonprofits. Increase driven by the number of donations from family foundations increasing by 10 percent and the average size of family foundation gifts increased by 25 percent in 2018. Deficit reflects the impact of foreign currency devaluation in HOPE programs. Financial statements are unaudited. 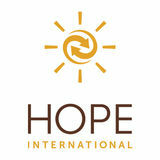 Audited financials will be posted at hopeinternational.org when they become available. 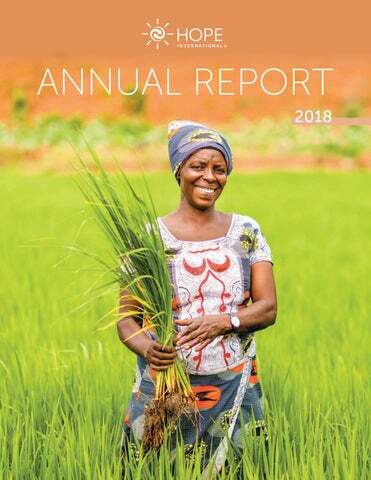 For the year ended December 31, 2018, HOPE International consolidated Higher Impact Properties; HOPE Global Investment Fund; HOPE Hong Kong; DSU Kigali; HOPEmanaged microfinance institutions in the Republic of Congo (HOPE Congo), Democratic Republic of Congo (HOPE DRC), Ukraine (HOPE Ukraine), Burundi (Turame Community Finance), and Rwanda (Urwego Bank); and savings group programs in Burundi, Haiti, Malawi, Rwanda, Zambia, and Zimbabwe. HOPE International is a network of organizations—including partners that are not consolidated on our balance sheet—and HOPE contributes financially to their growth. Net portfolio across the network of MFIs was approximately $50.5 million. The investment in MFIs and other assets includes financial investments at the program level across the network. Consists of client savings at HOPE Congo, Turame, and Urwego. Across the network of MFIs and saving groups, client savings totaled over $35 million. Bernadette Mukeshimana RICE AND BANANA FARMER Bernadette (front row, second from right) is part of a group of farmers leveraging loans and training from Urwego Bank, HOPE’s microfinance institution in Rwanda. Together, these rice growers are expanding their farmland, hiring more laborers, and cultivating greater harvests. 227 Granite Run Drive, Suite 250 | Lancaster, PA 17601 | 717.464.3220 | hopeinternational.org Copyright © 2019 HOPE International. All rights reserved. Printed on paper certified by the Forest Stewardship Council™ (FSC®) using vegetable-based inks.